Budapest has a long history of thermal baths, including the history of Szechenyi Spa Baths, the first hot spring bath palace on the Pest side of Budapest. In 2013 Szechenyi Baths turned 100 years old. But the history of the baths goes beyond 100 years, back to the 1870s and 1880s, when the deep hot spring wells were drilled under the Heroes’ Square near the City Park in Budapest. The palace of Szechenyi Bath was built between 1909 and 1913 in Neo-Baroque and Neo-Renaissance styles by Gyozo Czigler. 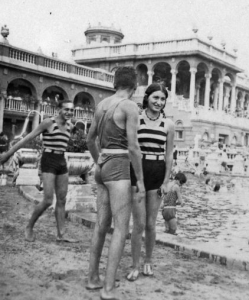 The former version of the baths were less spectacular, but very popular: the old “Szechenyi Bath” was simply called the Artesian Bath, and stood on the smallish Nador Island in the middle of the lake in the City Park. The stone walled bath was built in 1881 with marble baths and pools. 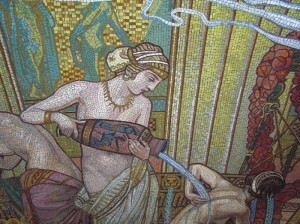 The Artesian Bath was used for twenty years. The hot spring water supply came from the artesian well drilled by Vilmos Zsigmondy Hungarian engineer who specialized in geothermal well drilling (originally mine engineer). This well was drilled 970 meter deep (0.6 mile), in a way so that the underground waters rich in minerals would be flowing spontaneously from the great pressure, like a fountain. The first well was supplying the baths until 1938. It gave 525 liters of water per minute. Nowadays the well is out of use (it is under Arpad Chieftain on the Heroes’ Sq). It took 10 years for Zsigmondy to find the waters under the City Park! The bust of Vilmos Zsigmondy can be seen in front of Szechenyi Baths (at the entrance from Kos Karoly Street). The Artesian Bath building was so popular that by the end of the 1880s the city councilors decided to build a bigger and nicer palace for bathing and relaxation. 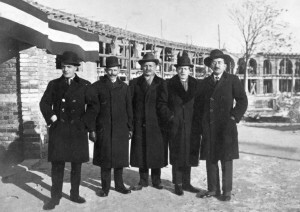 The construction of Szechenyi Baths began in 1909 based on the designs of Gyozo Czigler, professor of the Budapest Technical University (also designed Gozsdu Court and historical market halls in Budapest – Hunyadi Sq and Hold Street). Although the baths were initially called the Artesian Baths, by 1913, at the opening, they were already renamed as Szechenyi Gyogyfurdo, after Count Szechenyi (Istvan Szechenyi, the “Greatest Hungarian”). Czigler presented his plans at the national exhibition in 1896, when Hungary celebrated its 1000th birthday (and when the Hungarian Millennium Monument on Heroes’ Square, and the Vajdahunyad Castle were built). But true of all bureaucracies, it took 7 more years to get the designs officially accepted by the General Meeting. Although it was Gyozo Czigler who was the architect behind Szechenyi Bath, by the time the constructions works began in May 1909, he was dead unfortunately, so the actual building was erected with the help of his colleagues, Ede Dvorak and Kalman Gerster. The costs of building Szechenyi Baths were 3,900,000 Gold Crowns (at that time Hungary’s currency). The original building of Szechenyi Baths opened in 1913 was considerably smaller than what you see today. 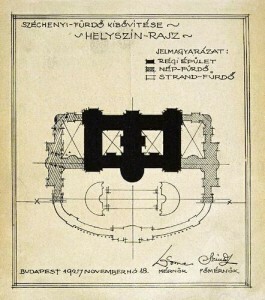 See the solid black drawing of this floor plan indicating the additions of the public bath and later the open air pools called Lido (Strand in Hungarian). 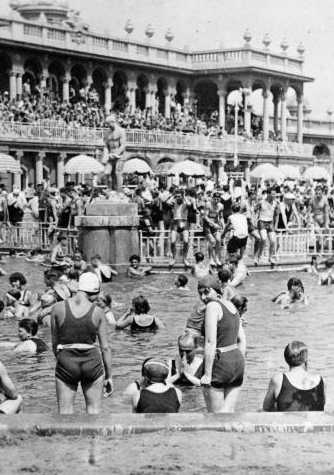 The popularity of the baths were increasing year by year. While in 1913 there were 200,000 people visiting Szechenyi Bath, by 1919 there were 890,507 bath guests enjoying the pools in the bath palace. Despite the huge success of Szechenyi Thermal Baths, the bath was not profitable. 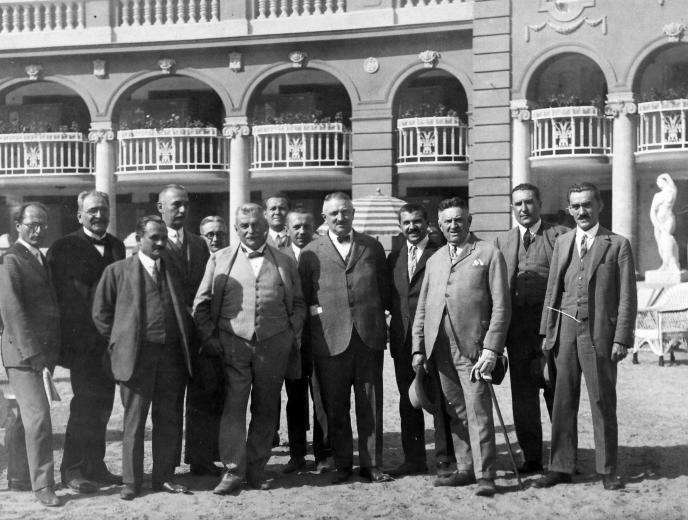 On the one hand, WWI presented a tough economic situation in Europe, on the other hand, the planned Szechenyi Bath Spa Hotel was not realized. 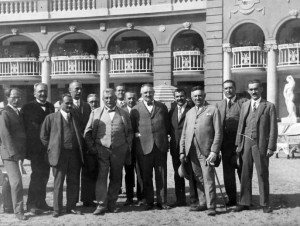 In 1924 the city council of Budapest voted for the expansion of Szechenyi Baths. The outdoor thermal baths, and the 50 meter long open air swimming pool was added to Szechenyi Bath, and opened in August 1927. It means that much of what you see in many photos of Szechenyi Furdo are the pools built in the 1920s based on the plans of Imre Francsek (who ended his life later in the Soviet Gulag camps). At that time the pools were surrounded by lots of sand, as the idea was to bring the sandy beach to Budapest city (with 2,800 square meters of sand). These days the poolsides are hard stone pavements (built in 1985). With the new pools, a new and deeper artesian well was drilled in the City Park. But it did not take ten years to hit the geo-thermal waters, as in the 1870s. The new well was drilled from 1936 to 1938: its water comes from the depth of 1256 meter (0.78 miles). The daily supply of this well is approx. 6,000 cubic meter of water at 77 °C (170.6°F), which is approx. 3500 liters per minute. It is so much that the mayor of Budapest in 1938, recommended building a Fountain and a Drinking Well in Szechenyi Baths for promotional reasons: these buildings were added in 1939. Needless to say, the hot spring waters are cooled with fresh cold water to provide an ideal temperate in the thermal baths, and a pleasant cooler water in the swimming pool. During the World War II, one fifth of Szechenyi Baths were damaged (the Siege of Budapest was one of the worst city sieges in the history of WW2). 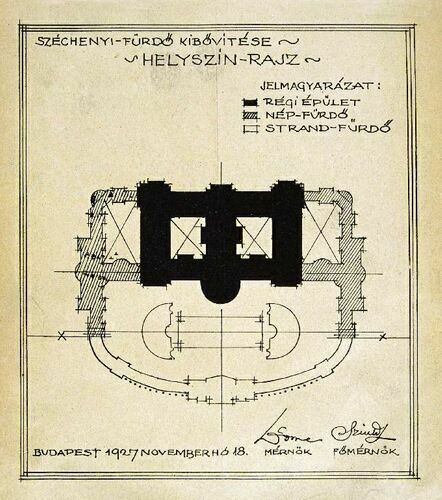 In March 1945, the male baths in the right wing were used by the liberating Soviet soldiers, while the left wing pools in the former female baths, were used by the local citizens of Budapest. It was only in 1963 that Szechenyi Baths remained open for the winter season, and since then it has proven a huge success (Szechenyi Bath is open at Christmas and on New Year’s Eve and Day too). This was the year when the corridors of changing cabins and lockers in Szechenyi Baths became insulated from the winter colds, and got heating. Before the restoration works began in 1997, there were closed, heated corridors leading to the outdoor pools in winter time, but these unsightly corridors were eventually pulled down to restore the aesthetics of the building of Szechenyi Baths. This means, that taking a bath robe and flip-flops are essential for winter bath guests, as there is a few seconds of walk in the freezing cold weather till you get to the steaming warm baths. During the Communist times, Szechenyi Baths were much neglected as the city had no financial means to restore the building. There was much corrosion, fungi, and the mosaics, statues, etc. were broken in many places. Thanks to the detailed restorations in the last few years, Szechenyi Bath is beautiful again, and recommended by top travel magazines in Europe and the US. Although for many decades Szechenyi Baths have operated with separate male and female baths (as well as a mixed bath in the middle section), by the 1970s it had become an obstacle. In 1981 Szechenyi Baths became fully mixed, all of its 18 pools for bath guests and the additional 3 hospital pools turned into co-educated. These days Szechenyi Bath is mixed all week, from Monday to Sunday. The only bath facility that is not mixed is the sunbathing rooftop terrace (and of course the toilets, shower rooms and public changing areas). As Szechenyi Bath was originally planned for separate male and female pools, the structure of the building is symmetrical, with the same type and number of pools on both sides: men in the right wing could use the same sort of pools and bath facilities as women in the left wing. This symmetry makes navigation in the baths perhaps a bit easier, although the Bath Palace is very big, so we recommend taking the map of Szechenyi Baths with you, if you are a first time visitor. 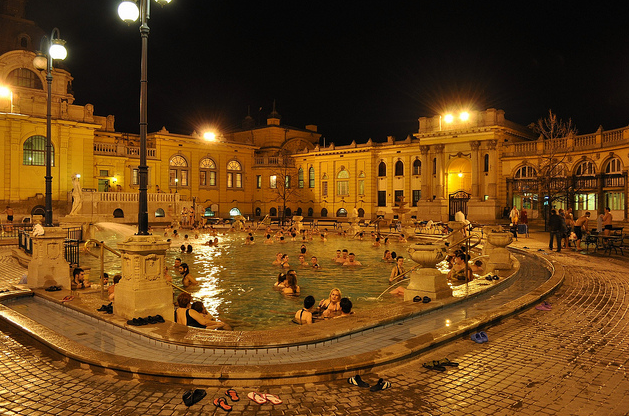 The history of Szechenyi Baths is a living history. In recent years there have been big changes, like the the opening of the Szechenyi Bath Hospital in 1982, taking care of daily 178 patients. Or the addition of the Whirlpool fun in the former Children’s Pool in Szechenyi Baths (the pools are only recommended for children over 14). 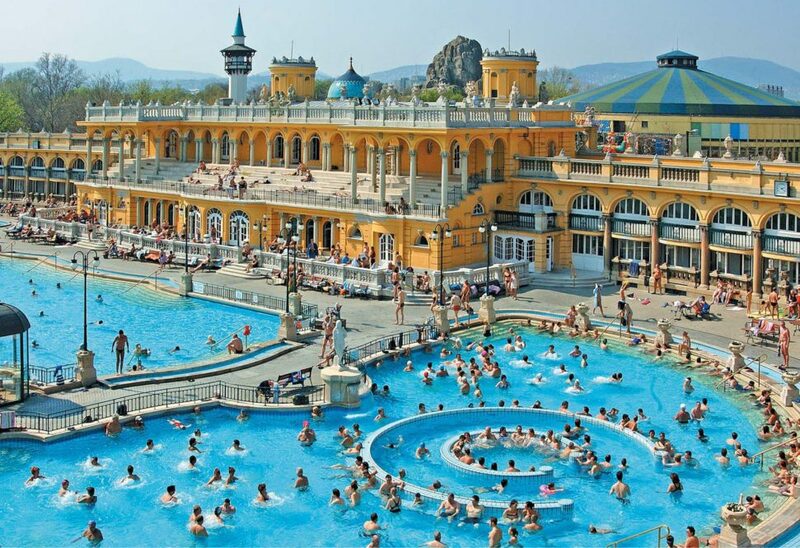 Budapesters love to bathe, at the lushly ornate Széchenyi Gyogyfürdo, where healing spring waters bubble up from over 4,000 feet below the ground. There can be few places in the world where water is as lavishly celebrated. Even the word ‘Gyogyfürdo’, meaning a spa or medical baths, suggests something surreal and fantastical. 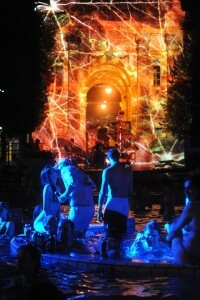 On top of the restoration works, there have been new developments and new events in the baths, like the environmental friendly geothermal heating pipes built between Szechenyi Baths and the Budapest Zoo, or the amazing weekend spa parties in the outdoor pools in Szechenyi Bath: laser shows, video installations and lots of music for party goers. Something the architects would not have dreamed about for sure. 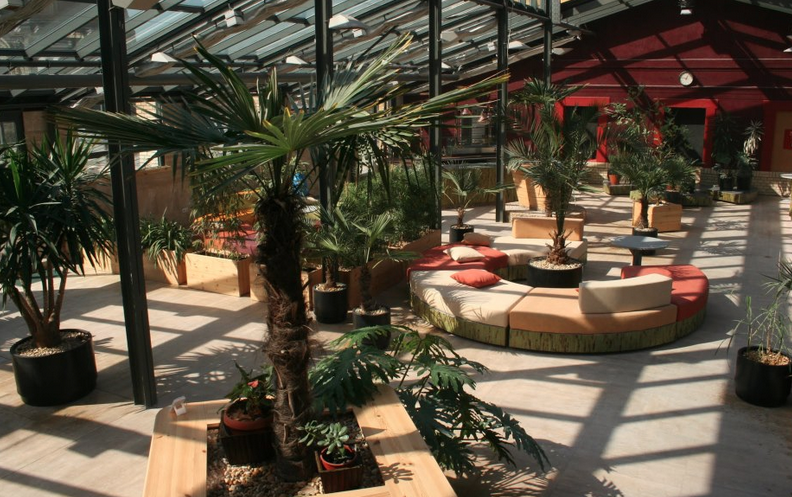 In 2009 Szechenyi Bath got a real spa oasis, a rooftop spa called Palm House. It is an actual Palm House with nice palm trees and other exotic plants that love the heat of the thermal baths and the lots of sunshine and light coming through the glass roof. The Palm House has a pleasant air and environment. Or the addition of Szecska sparties in 2010, when an amazing bath party series started to make Szechenyi Baths an exciting and futuristic venue for the younger generation. By the way, no one knows when locals started to call Szechenyi Baths “Szecska” as a nickname (sech-kah), but the spa parties are called Szecska to show that we love Szechenyi Furdo. Much of Szechenyi Baths have been restored since 1997: the public pools and thermal baths had been restored for ten years, but even these days there are restoration works in some parts of Szechenyi Furdo, for instance in the 51 (!) private baths, which seem square bath tubs built in the floor with contemporary standards, but in the 1910s, they were extremely luxurious medicinal baths with modern treatments. 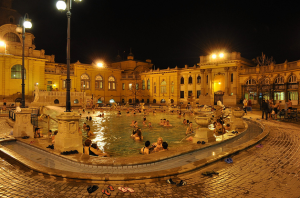 The hot spring waters of Szechenyi Baths are re-cycled in two ways. First of all, the used thermal waters are channeled into the artificial lake in the City Park (which is a boating lake in summer months, and a skating rink in winter months). Further, the heat of the thermal well is recycled in Budapest Zoo in various ways. Most importantly, since September 2011, the heat of the bath waters are recycled in the Budapest Zoo to supply warm air for the animals and in 40 of the buildings in the zoo (two thirds of the zoo), this way halving the costs of gas heating. Also, the hippos in the Budapest Zoo are enjoying geothermal waters from Szechenyi Furdo. 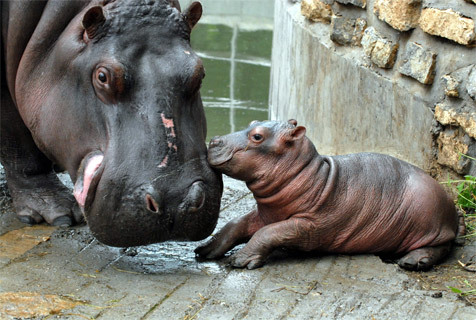 Some experts believe that the thermal waters enabled the hippo couple to get a little baby hippo in captivity (hippos do not replicate in captivity, so this was a big success), making the mom hippo fertile. 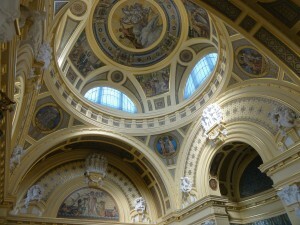 The architecture of the Szechenyi Thermal Bath palace is dominated by Neo-Baroque and Neo-Renaissance. The building is rich in water metaphors and water allegories in its rich decorations. There are many aqua motifs, statues related to water mythologies, water gods and goddesses, as well as the history of humanity and water (drinking, hot water, irrigation, etc). You can see water monsters mixed with fish, swans, dolphins, shells, clams and mermaids, in statues or in fantastic detailed mosaics, on the lamp posts, in the reliefs on the walls, etc. Cupola Mosaics made by Miksa Roth based on the designs of Zsigmond Vajda (the Cupola Room in Szechenyi Baths is free to visit, so feel free to take a peek inside): the central mosaic piece depicts the Sun God Helios on his Quadringa. Around Helios, you can see the Zodiac signs. The semi-circular mosaics show ancient water scenes from Egypt, Greece, Rome and the East.